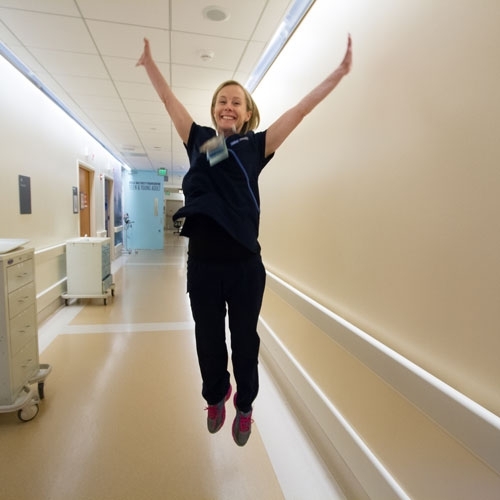 "I love kids, so I only ever wanted to be a pediatric nurse," says Sharon Doggett, who for the past decade has been caring for children at UCLA Medical Center, Santa Monica. Sharon's constantly inspired by her patients. "They're so positive; their ability to stay positive through everything is amazing. They make me want to come to work every day. I feel like if they can do it, I have to do something to help them." She's also known as a cheerleader for their families. "I try to encourage [the family] to be a part of the care, right from the start. When they're here, they can feel a little helpless because their child is sick, and it's really helpful to us, and can help guide our treatments, when the family is involved. I think it's important to build a relationship with the patients right from the start."